Please arrive five to ten minutes early to allow time to check in and get settled. Always check in at the front desk even if you’ve made an online reservation. We suggest you wear comfortable, non-restrictive workout clothing. Layers help to adjust for temperature changes during and after class. Remove your shoes before entering the yoga room. You may leave your shoes in a cubby in the studio lobby. This preserves the sacred nature of the studio space. We recommend taking your valuables inside the studio. Please practice Saucha (cleanliness) by kindly wiping up any sweat from around your yoga mat after class. Your yoga Sangha (community) will thank you for your thoughtfulness. Please refrain from wearing fragrances, perfume or cologne to class and remember to turn your cell phone off. We suggest starting with Gentle Yoga or Yoga I classes and avoid eating heavy food one to two hours before class. Please notify your teacher of any injuries or medical conditions. This helps your instructor understand how best to assist you during class. If you have your own yoga mat, please bring it to class. We also have mats available for rent. To receive maximum benefits, yoga should be practiced daily or a minimum of two times per week. Yoga has potential for benefit for patients with coronary artery disease though objective, angiographic studies are lacking. We evaluated possible role of lifestyle modification incorporating yoga, on retardation of coronary atherosclerotic disease. In this prospective, randomized, controlled trial, 42 men with angiographically proven coronary artery disease (CAD) were randomized to control (n = 21) and yoga intervention group (n = 21) and were followed for one year. The active group was treated with a user-friendly program consisting of yoga, control of risk factors, diet control and moderate aerobic exercise. The control group was managed by conventional methods i.e. risk factor control and American Heart Association step I diet. At one year, the yoga groups showed significant reduction in number of anginal episodes per week, improved exercise capacity and decrease in body weight. Serum total cholesterol, LDL cholesterol and triglyceride levels also showed greater reductions as compared with control group. Revascularization procedures (coronary angioplasty or bypass surgery) were less frequently required in the yoga group (one versus eight patients; relative risk = 5.45; P = 0.01). Coronary angiography repeated at one year showed that significantly more lesions regressed (20% versus 2%) and fewer lesions progressed (5% versus 37%) in the yoga group (chi-square = 24.9; P < 0.0001). The compliance to the total program was excellent and no side effects were observed. Yoga lifestyle intervention retards progression and increases regression of coronary atherosclerosis in patients with severe coronary artery disease. It also improves symptomatic status, functional class and risk factor profile. The overall benefits of yoga on risk factors for heart disease were evaluated by researchers at Bhabha Atomic Research Centre, Medical Division, in Mumbai, India. (Mumbai is the new name for the city formerly known as Bombay. The name was changed in the mid 1990s. The effect of yoga on the body, psychological well being, and cardiovascular risk factors was studied in a group of middle aged patients. Twenty patients (16 males, 4 females) in the age group of 35 to 55 years with mild to moderate high blood pressure underwent yogic practices daily for one hour for three months. High blood pressure is a risk factor for heart disease, stroke, and kidney damage. Biochemical and psychological parameters were studied prior and following period of three months of yoga. These biochemical parameters included blood sugar, lipid profile including cholesterol, and blood levels of catecholamine (stress chemicals like epinephrine or adrenaline). The overall results were quite positive. There was a decrease in blood pressure along with a decrease in blood sugar, cholesterol and triglycerides. The patients also reported an improvement in overall well being and quality of life. There was also a decrease in the levels of catecholamine, suggesting a decrease in sympathetic activity. A decrease in sympathetic activity indicates that the patients were calmer and experienced less tension and stress, and that their blood pressure would be lower. The authors of the study conclude that yoga can play an important role in decreasing the risk factors for cardiovascular disease in those with mild to moderate hypertension. "Retardation of Coronary Atherosclerosis with Yoga Lifestyle Intervention." Manchanda SC, Narang R, Reddy KS, Sachdeva U, Prabhakaran D, Dharmanand S, Rajani M, Bijlani R. All India Institute of Medical Sciences, New Delhi, India. J Assoc Physicians India 2000 Jul;48(7):687-94 Related Articles. The regular practice of yoga helps to reduce stress and increase strength, balance and flexibility. There are also mental and emotional benefits to yoga, which include a greater ability to concentrate and enhanced emotional stability. By focusing on your breath in the poses and bringing your attention back to the body, the mind quiets. Clinical research has concluded the practice of yoga has profound medical benefits. Benefits can be achieved without the use of expensive medications that often cause negative side effects. Clinical data supports these conclusions, resulting from a regular yoga practice. A new study published in the April issue of Cancer, a medical journal targeted to doctors who treat cancer patients, reports that a gentle form of yoga helps those with lymphoma sleep better. Lymphoma is a cancer that arises in the cells of the immune system. The investigators found that among 39 patients being treated for lymphoma, those who participated in only seven weekly sessions of yoga said they got to sleep sooner, slept for longer, and needed fewer drugs to fall asleep. Study author Dr. Lorenzo Cohen, of the M. D. Anderson Cancer Center in Houston, Texas, explained that living with cancer can be a very stressful experience, as patients cope with a diagnosis of a life-threatening illness and the side effects of treatment. As is well known, stress can often interfere with patients' sleep habits. Over the years, studies have linked yoga to a number of health benefits, including lowering blood pressure, beating fatigue and easing chronic pain. In the current report, Cohen and his team asked half of the patients to participate in seven weekly sessions of yoga and the results were compared to other patients with lymphoma who did not participate in the yoga program. Some studies have suggested that up to three quarters of cancer patients struggle with sleep. This may have important health consequences since sleep disturbances have been linked with problems with the immune system, and an increased risk of illness or death. Individuals with cancer should be cautioned that while undergoing or recovering from treatment one should adopt a gentle routine, and avoid excessively strenuous routines. This is particularly true for cancer patients who have metastases to the bones which would make the skeletal system more prone to fractures. There is good reason to expect that a gentle form of yoga would be beneficial to not only patients with lymphoma, but those suffering from other types of cancer. Nine studies conducted with cancer patients and survivors yielded modest improvements in sleep quality, mood, stress, cancer-related distress, cancer-related symptoms, and overall quality of life. Studies conducted in other patient populations and healthy individuals have shown beneficial effects on psychological and somatic symptoms, as well as other aspects of physical function. CONCLUSIONS: Results from the emerging literature on yoga and cancer provide preliminary support for the feasibility and efficacy of yoga interventions for cancer patients, although controlled trials are lacking. Further research is required to determine the reliability of these effects and to identify their underlying mechanisms. "Cancer Control" 2005 Jul;12(3):165-71. Bower JE, Woolery A, Sternlieb B, Garet D. University of California, Los Angeles Cousins Center for Psychoneuroimmunology, Los Angeles. One of the major problems from long term diabetes is nerve damage due to constant high sugar levels in the body. This nerve damage leads to the slowing of nerve impulses, decreased sensation, numbness of the feet, and poor bowel function. Can yoga help? Scientists at Guru Tegh Bahadur Hospital, in Delhi, India, studied a group of 20 type 2 diabetic subjects between the ages of 30-60 years. Their aim was to see whether Yoga asanas had any effect on nerve conduction. The Yoga asanas included Suryanamskar Tadasana, Konasana, Padmasana Pranayam, aSavasana, Pavanmukthasana Sarpasana and Savasana. The Yoga exercises were performed for 40 minutes every day for 40 days in the above sequence. The subjects continued their normally prescribed medicines and diet. Blood sugar and nerve conduction velocity of the median nerve (in the hand) were measured and repeated after 40 days of the Yogic regime. Another group of 20 type 2 diabetes subjects of comparable age and severity, called the control group, were kept on prescribed medication and light physical exercises like walking. Their initial & post 40 days parameters were recorded for comparison. At the end of the 40 days, those who did the yoga had improved the nerve impulse in their hands. The hand nerve conduction velocity increased from 52.8 meters per second to 53.8 m/sec. The control group nerve function deteriorated over the period of study, indicating that diabetes is a slowly progressive disease involving the nerves. The authors conclude that Yoga asanas have a beneficial effect on blood sugar control and improve nerve function in type 2 diabetics who have mild nerve damage. Dr. Sahelian says: In addition to Yoga, I recommend my patients with diabetes take a nutrient called lipoic acid which has also been found to improve nerve function in diabetics. Certain yoga asanas, if practiced regularly, are known to have beneficial effects on human body. Researchers at the University College of Medical Sciences, in Shahdara, New Delhi evaluated 24 patients aged 30 to 60 year old who had non-insulin dependent diabetes mellitus, also called Type II diabetes. Diabetics who require insulin are called Type I, while Type II diabetics are treated with diet, exercise, and oral medicines that lower blood sugar. The researchers evaluated the baseline fasting blood sugar levels of the patients, and they also performed pulmonary function studies. These pulmonary function studies measure lung capacity and the amount of air that can be exhaled within the first second of a rapid exhale. After performing these basic tests, yoga experts gave these patients training in yoga asanas. The yoga practice was done 40 minutes a day for 40 days. These asanas consisted of 13 well known and common postures, done in a sequence. After 40 days of yoga asanas regimen, the testing was repeated. The results indicate that there was significant decrease in fasting blood sugar levels from about 190 initially to 140 after the 40 day period of yoga activity. Fasting blood sugar in people without diabetes is usually below 120. The lung studies showed an average improvement of about 10 percent in lung capacity. These findings suggest that better blood sugar control and pulmonary functions can be obtained in type I diabetics when they stick to a daily schedule of yoga asanas and pranayama. The exact mechanism as to how these postures and controlled breathing interact with physio-neuro-endocrine mechanisms affecting blood sugar and pulmonary functions remains to be worked out. Improvement in handgrip strength in normal volunteers and rheumatoid arthritis patients following yoga training. The present study aimed at assessing the effects of a set of yoga practices on normal adults, children and patients with rheumatoid arthritis. An equal number of normal adults, children, and patients with rheumatoid arthritis who did not practice yoga were studied under each category, forming respective control groups. Yoga and control group subjects were assessed at baseline and after varying intervals, as follows, adults after 30 days, children after 10 days and patients after 15 days, based on the duration of the yoga program, which they attended, which was already fixed. Hand grip strength of both hands, measured with a grip dynamometer, increased in normal adults and children, and in rheumatoid arthritis patients, following yoga, but not in the corresponding control groups, showing no re-test effect. Adult female volunteers and patients showed a greater percentage improvement than corresponding adult males. This gender-based difference was not observed in children. Hence yoga practice improves hand grip strength in normal persons and in patients with rheumatoid arthritis, though the magnitude of improvement varies with factors such as gender and age. Indian J Physiol Pharmacol, 2001 Jul;45(3):355-60 Dash M, Telles S. Swami Vivekananda Yoga Research Foundation, No. # 9, 1st Main, Chamarajpet, Bangalore-560 018. Dr. Vijay Vad, sports medicine specialist at the Hospital for Special Surgery in Manhattan is studying 50 patients with herniated disks who are suffering from lower back pain. Half the patients are taking daily doses of the anti-inflammatory drug Celebrex as well as Vicodin for severe pain. A second group doesn't take drugs, but instead spends 15 minutes, three days a week on an exercise program that is about 70 percent yoga and 30 percent Pilates, a technique that involves a series of low-impact flexibility and muscle exercises. The program, dubbed "Back Builders," specifically excludes many popular sitting and bending positions that can aggravate back problems. After three months, the results have been striking: 80 percent of patients in the yoga group reported that their pain was reduced by at least half. In the group taking drugs, only 44 percent improved. Three patients, or 12 percent of the yoga group, re-injured their backs during the period; that compares with 14, or more than half of patients in the medication group. Dr. Vad, who consults with the men's professional tennis and golf tours, notes that in India, where yoga is widely practiced, lower-back problems are virtually unheard of. The practice of yoga during pregnancy seems to improve birth weight and reduce prematurely and overall complications. Dr. Shamanthakamani Narendran, from the Vivekananda Yoga Research Foundation in Bangalore, and colleagues studied 169 pregnant women trained in the integrated approach to yoga and in 166 "controls" who received routine prenatal care. The yoga training included various loosening exercises, postures ("asanas"), relaxation, deep breathing exercises ("pranayamas"), and meditation, which was practiced for 1 hour daily. Fourteen percent of deliveries were premature in the yoga group compared with 29 percent in the controls. Rates of pregnancy-related high blood pressure were also lower in the yoga group. Possible mechanisms whereby yoga improves pregnancy outcomes include increased blood flow to the placenta, decreased transfer of maternal stress hormones, and decreased premature release of hormones that trigger the onset of labor. "Journal of Alternative and Complimentary Medicine", April 2005. A new study led by researchers at Fred Hutchinson Cancer Research Center has found that regular yoga practice may help prevent middle-age spread in normal-weight people and may promote weight loss in those who are overweight. The study - the first of its kind to measure the effects of yoga on weight - appears in the July/August issue of Alternative Therapies in Health and Medicine. Funded by the National Cancer Institute, the study involved 15,500 healthy, middle-aged men and women who were asked to complete a written survey recalling their physical activity (including yoga) and weight history between the ages 45 and 55. The study measured the impact of yoga with weight change, independent of other factors such as diet or other types of physical activity. The researchers found that between the ages of 45 and 55, most people gained about a pound a year, which is a common pattern as people age and do not adjust their caloric intake to their declining energy needs. "However, men and women who were of normal weight at age 45 and regularly practiced yoga gained about 3 fewer pounds during that 10-year period than those who didn't practice yoga," said Alan R. Kristal, Dr.P.H., the study's lead author. For the study, regular yoga practice was defined as practicing at least 30 minutes once a week for four or more years. But the researchers noted the greatest effect of regular yoga practice was among people who were overweight. "Men and women who were overweight and practiced yoga lost about 5 pounds, while those who did not practice yoga gained about 14 pounds in that 10-year period," said Kristal, a member of the Hutchinson Center's Public Health Sciences Division and a professor of epidemiology at the University of Washington School of Public Health and Community Medicine. Ten healthy, untrained volunteers (nine females and one male), ranging in age from 18-27 years, were studied to determine the effects of hatha yoga practice on the health-related aspects of physical fitness, including muscular strength and endurance, flexibility, cardio respiratory fitness, body composition, and pulmonary function. Subjects were required to attend a minimum of two yoga classes per week for a total of 8 weeks. Each yoga session consisted of 10 minutes of pranayamas (breath-control exercises), 15 minutes of dynamic warm-up exercises, 50 minutes of asanas (yoga postures), and 10 minutes of supine relaxation in savasana (corpse pose). The subjects were evaluated before and after the 8-week training program. Isokinetic muscular strength for elbow extension, elbow flexion, and knee extension increased by 31%, 19%, and 28% (p<0.05), respectively, whereas isometric muscular endurance for knee flexion increased 57% (p<0.01). Ankle flexibility, shoulder elevation, trunk extension, and trunk flexion increased by 13% (p<0.01), 155% (p<0.001), 188% (p<0.001), and 14% (p<0.05), respectively. Absolute and relative maximal oxygen uptake increased by 7% and 6%, respectively (p<0.01). These findings indicate that regular hatha yoga practice can elicit improvements in the health-related aspects of physical fitness. (c)2001 CHF, Inc. "Effects of Hatha Yoga Practice on the Health-Related Aspects of Physical Fitness." Prev Cardiol 2001 Autumn;4(4):165-170. Tran MD, Holly RG, Lashbrook J, Amsterdam EA. Department of Exercise Science, University of California at Davis, Davis, CA 95616. There have been quite a number of studies that show regular exercise improves stamina, but hardly any that evaluate the effect of yoga on stamina (perceived physical exertion). In a research project conducted at the Defense Institute of Physiology in Delhi, India, the effect of training in Hatha yogic exercises on aerobic capacity and stamina was performed on 40 young men who were recruited in the Indian army. These soldiers, whose age ranged from 19 to 23, initially worked out to maximal exercise capacity on a bicycle ergometer. The oxygen consumption, carbon dioxide output, pulmonary ventilation, respiratory rate, heart rate etc., at maximal exertion were immediately thereafter recorded. The subjects were then divided into two equal groups. One group practiced Hatha yogic exercises for 1 h every morning (6 days in a week) for six months. The other group underwent conventional physical exercise training during the same period common to what many soldiers are required to do. In the 7th month, tests for perceived physical exertion were repeated on both groups of subjects. The results showed that those who engaged in daily yoga practice noticed that they did not get as tired after heavy physical exertion as those who just did regular exercises. Their aerobic capacity also improved. Therefore, it appears that yoga enhances stamina even better than regular exercise. This would indicate that athletes in many different fields may well improve their endurance and performance by adding yoga practices to their routine workouts. Yoga could also certainly be helpful for those who have fatigue or low energy. More and more doctors specializing in multiple sclerosis note that yoga, with its emphasis on relaxation, breathing, and deliberate movements, is a good choice for people with MS. Multiple sclerosis (MS) is a life-long chronic disease. During an MS attack, inflammation occurs in areas of the white matter of the central nervous system (nerve fibers that are the site of MS lesions) in random patches called plaques. This process is followed by destruction of myelin, which insulates nerve cell fibers in the brain and spinal cord. Myelin facilitates the smooth, high-speed transmission of electrochemical messages between the brain, the spinal cord, and the rest of the body. Symptoms of MS may be mild or severe and of long duration or short and appear in various combinations. The initial symptom of MS is often blurred or double vision, red-green color distortion, or even blindness in one eye. Most MS patients experience muscle weakness in their extremities and difficulty with coordination and balance. A recent study at Oregon Health and Science University indicates that both yoga and exercise help reduce fatigue in people with MS. Researchers divided 69 people with MS into three groups for six months. 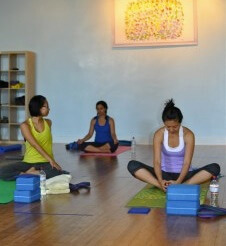 The first group did weekly Iyengar yoga classes adapted for people with MS. The second group did weekly exercise classes -- including workouts on stationary bikes and home exercise -- that were also tailored to people with MS. The third group maintained their normal activity levels. After six months, they were given the chance to enroll in the yoga or exercise classes. The study participants were monitored for changes in their cognitive function, fatigue and quality of life. Yoga and exercise had no effect on cognitive function. However, the people taking the yoga or exercise classes did show significant improvement in their levels of fatigue. The findings were presented at the American Academy of Neurology's annual meeting in Honolulu in April 2003. Doctors and researchers are increasingly intrigued by yoga's potential to treat mental-health problems. One study, published in CNS Spectrums, a peer-reviewed psychiatric medical journal, examined 22 adults who suffered from obsessive compulsive disorder, an often-disabling condition that causes odd compulsions, such as excessive counting. Half the group used standard meditation, while the other half used "Kundalini yoga," which requires patients to focus both eyes on the tip of their nose, press their tongues to the roof of their mouths, open their jaws and breathe through their noses for at least six minutes. After three months, the yoga group posted a 40 percent improvement, compared with 14 percent in the non- yoga group. Later both groups received the yoga treatment, and after a year posted an average improvement of 70 percent. One of those patients, a 53-year-old San Diego resident who didn't want to be named, had been taking the anti-anxiety drug Paxil when he entered the study and says he was "totally skeptical" that yoga could help him. Today most of his symptoms have disappeared. "OCD is not a problem I currently deal with," he says. "The results are rather striking and hard for some people to believe," says David Shannahoff-Khalsa, one of the study's authors and director of the research group for mind-body dynamics at the University of California-San Diego's Institute for Nonlinear Science. Significant benefits of yoga as a prescribed medical therapy are the lack of negative side effects or prohibitive cost to all patients. Currently there are over fifty clinical trials in progress in the United states exploring the medical benefits of Yoga. Globally the numbers are far greater.